Morrissey has featured several of Mayne's photos on record sleeves and during the 1997 tour as backdrops. 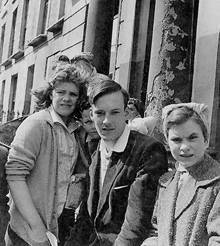 ↑ Roger Mayne Wikipedia page. Wikipedia. Retrieved from Wikipedia.org. This page was last modified on 14 June 2014, at 12:30.